Please email us at thistledew@ymail.com to see what Fruits are in season. We also offer many different trail mixes as well. Bags start at $3.50 for a 4"x6" bag. Comments: Apricots are grown in Turkey and dried in the warm middle-eastern sun until moist, chewy, smooth and velvet texture is reached. Naturally fat, cholesterol free, and a good source of dietary fiber. Ingredients: Apricots and Sulphur Dioxide (to promote color retention). Nutrition Facts: Serving Size: 40g, Amount Per Serving: Calories 120, Cal. From Fat 0, Total Fat 0g (0% DV), Saturated Fat 0g (0% DV), Cholesterol 0mg (0% DV), Sodium 10mg (<1% DV), Total Carbohydate 29g (10% DV), Dietry Fiber 4g, Sugars 15g, Protein 1g, Vitamin A (2% DV), Vitamin C (2% DV), Calcium (4% DV), Iron (6% DV). Percent Daily Values (DV) are based on a 2,000 calorie diet. Comments: Fried, sliced bananas from the Phillipines. Ingredients: BANANAS, COCONUT OIL, SUGAR, NATURAL BANANA FLAVOR. 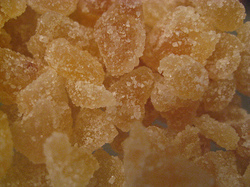 Uses: Dried fruits are very versatile. Use in baked goods, salads, sauces, stuffings, trail mixes, hot cereals, muffins, scones, fruit cakes and for homemade ice cream. 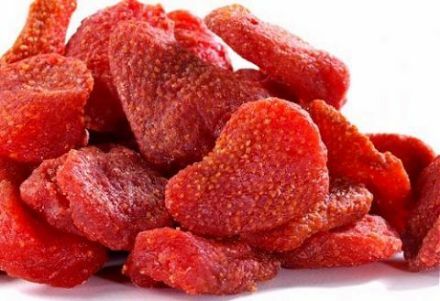 Dried fruits may be eaten right out of the bag as a convenient and healthy snack, mixed with granola and almonds or in a trail mix. Comments: These delicious berries (Vaccinia Corymbosum) grow on bushes, both cultivated and in the wild. Though the wild berries are a favorite of the black bear, it is the cultivated berries that make their way into food markets. When dried they retain all of their sweetness, but become more versatile Blueberries have a reputation for increasing night vision, and, therefore, were eaten by British pilots during World War I. Think of blueberries as an alternative to raisins.No sulfites. 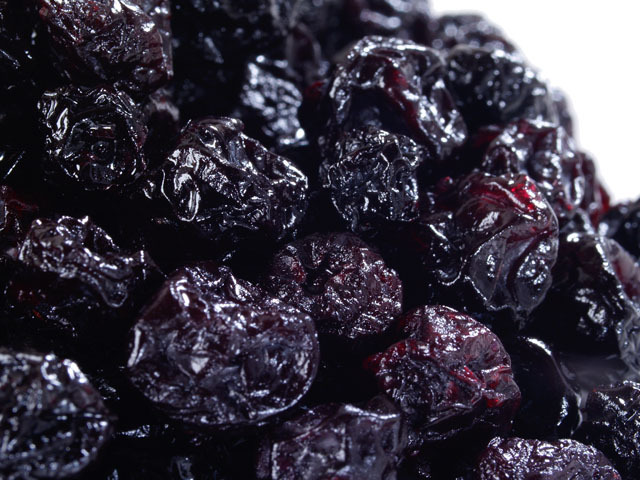 Dried Blueberries are mechanically dried. Ingresients: Cranberries, Sugar, Sunflower Oil. 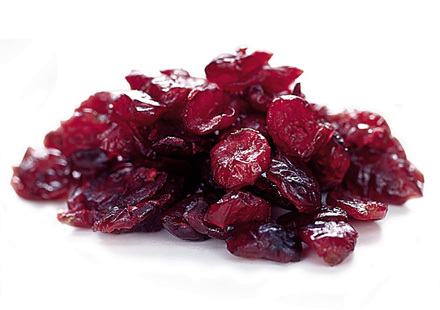 Uses: Currants can be sprinkled on top of vegetables or meats; tossed into salads for an interesting slightly sour note. Currants can play the role of a lemon or light vinegar in sweet and sour dishes. They are wonderful in sweet dishes; scones, muffins or in fruit toppings served over cakes or ice cream. Comments: The origin of the word currant is unclear. Most likely the name comes from a distortion of the name of the Helenistic city, Corinth. It was from this location that currants were shipped across the ancient world. 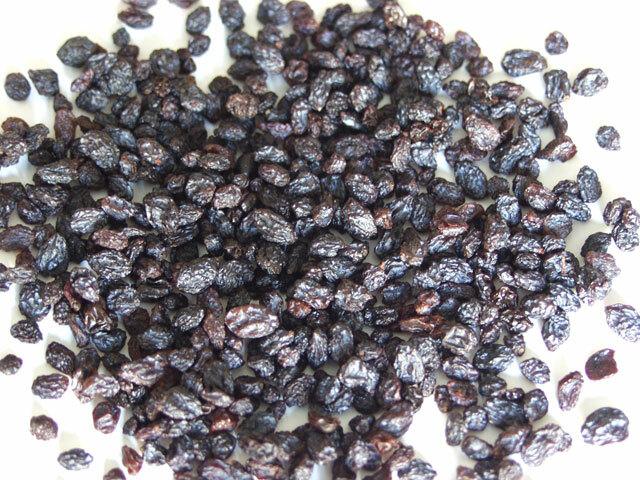 Dried Zante Currants look like petite raisins. 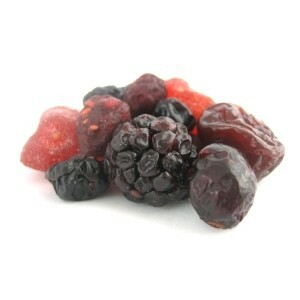 The flavor of a currant is reminiscent of raisins but they have a lighter flavor and an almost licorice undertone. 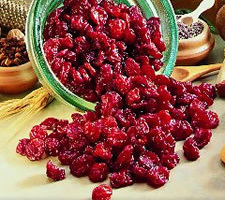 Currants are low in calories and high in Vitamin C. Use in baked goods, salads, sauces, stuffings, trail mixes, hot cereals, muffins, scones, fruit cakes and for homemade ice cream. 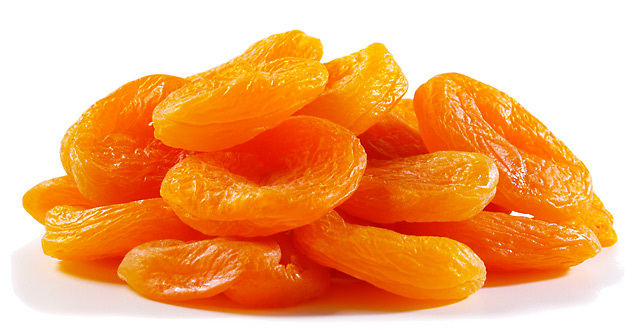 Dried fruits may be eaten right out of the bag as a convenient and healthy snack. Mix with granola and almonds or in a trail mix.No sulfites. 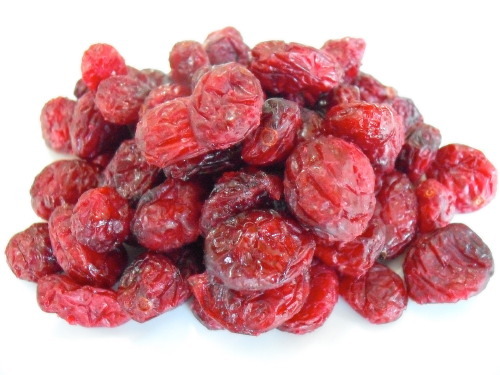 Dried Zante Currants are Sun-dried. Ingredients: Pinapple, Sugar, Apricots, Raisins, Diced Apple, Tart Cherries, Papaya, Canola Oil, Sulphur Dioxide. Nutrition Facts: Serving Size: 100g, Amount Per Serving: Calories 341, Cal. From Fat 0, Total Fat 0g (0% DV), Saturated Fat 0g (0% DV), Cholesterol 0mg (0% DV), Sodium 98mg (4% DV), Total Carbohydate 84g (28% DV), Dietry Fiber 6g, Sugars 58g, Protein 1g, Vitamin A (2% DV), Vitamin C (1% DV), Calcium (6% DV), Iron (11% DV). Percent Daily Values (DV) are based on a 2,000 calorie diet. Ingredients: Golden Raisins, Currents, Cranberries, Dark Seedless Raisins, Blueberry Flavor Cranberries, Tart Cherries and Strawberries. Comments: Use Very Berry Fruit Mix as a healthy snack anytime. Nutrition Facts: Serving Size: 40g, Amount Per Serving: Calories 122, Cal. From Fat 2, Total Fat 0g (0% DV), Saturated Fat 0g (0% DV), Cholesterol 0mg (0% DV), Sodium 11mg (0.5% DV), Total Carbohydate 32g (11% DV), Dietry Fiber 2g, Sugars 24g, Protein 1g, Vitamin A (2% DV), Vitamin C (1% DV), Calcium (2% DV), Iron (4% DV). Percent Daily Values (DV) are based on a 2,000 calorie diet. Uses: Mango is sweet and flavorful added to muffins, quick breads and fruit slads. 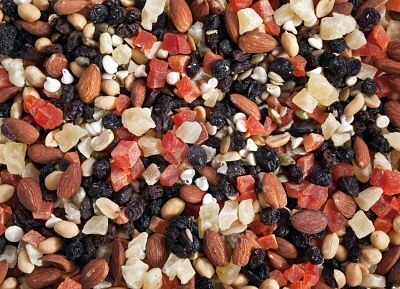 Mix with nuts, seeds and raisins to create your own trail mix. Try mango and coconut in rice pudding instead of raisins. Ingredients: Mango, sugar, citric acid, sulfur dioxide (s a preservative), FD&C yellow #5, and #6. Comments: Mangoes (Mangifera indica) are native to Southeast Asia and have been cultivated there and in other areas for 6000 years. Three fourths of all mangoes come from Asia. Mangoes come in different sizes, colors and flavors. 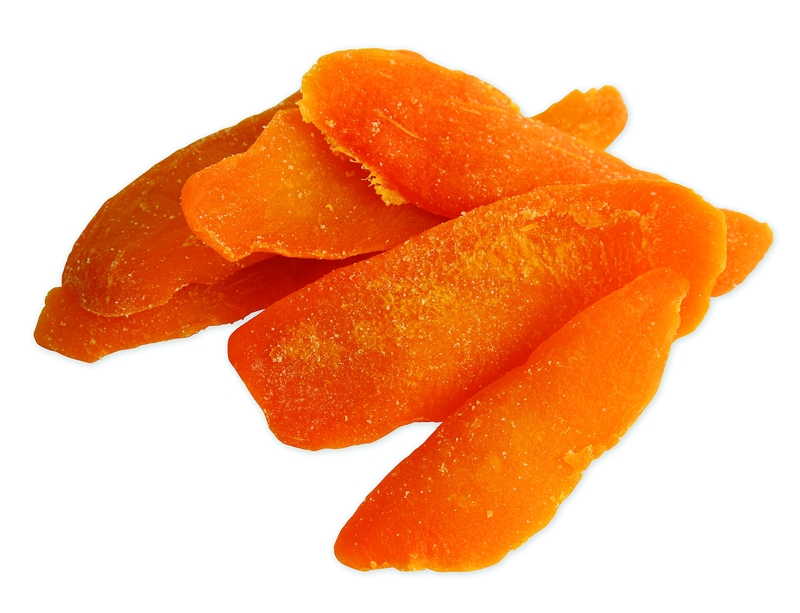 The dried mango we sell is a deep orange-red with a very sweet and rich flavor. Mango is very high in Vitamins A and C. It is low in sodium and high in fiber. Contains sulfites. 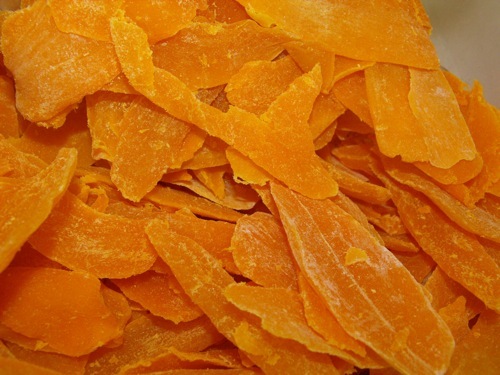 Dried Sliced Mangoes are mechanically dried. Ingredients: Papaya and Sulphur Dioxide (to promote color retention). 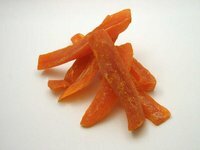 Comments: Papaya is a tropical dried fruit, with a wonderful exotic flavor. Use it in fuit mixed, or as a snack. Nutrition Facts: Serving Size: 40g, Amount Per Serving: Calories 140, Cal. From Fat 0, Total Fat 0g (0% DV), Saturated Fat 0g (0% DV), Cholesterol 0mg (0% DV), Sodium 90mg (4% DV), Total Carbohydate 35g (12% DV), Dietry Fiber 1g, Sugars 29g, Protein 0g, Vitamin A (0% DV), Vitamin C (0% DV), Calcium (4% DV), Iron (4% DV). Percent Daily Values (DV) are based on a 2,000 calorie diet. Uses: Dried Pineapples are great out of the bag or in trail mix. They can be baked in cakes; they are also wonderful when broken up into small pieces and cooked into rice pudding. 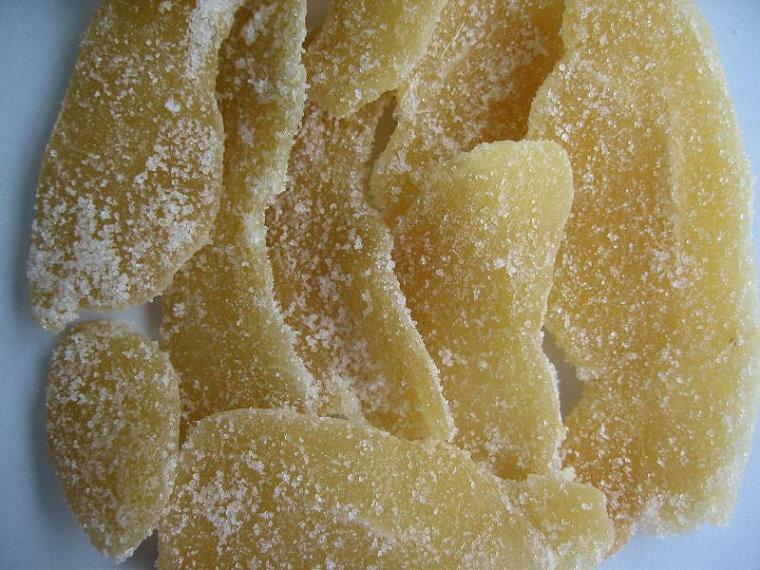 Dried Pineapple can be used in some Chinese dishes, they blend well with pork. Ingredients: Pineapple, sugar, citric acid, and sulfur dioxide as a preservative. Comments: Pineapple(Ananas comosus) is named as such because of its resemblance to a pine cone. In most European languages, besides English, the Pineapple is known as Ananas which is derived from the Paraguayan name for excellent fruit. The Pineapple is native to Central and South America. 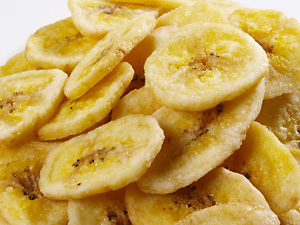 Dried Pineapple, like the fresh fruit, has a sweet mildly tart taste. Pineapples are a good source for Vitamins C and A. Contains sulfites. 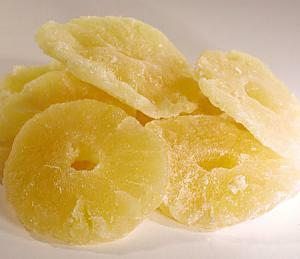 Dried Pineapples are mechanically dried. 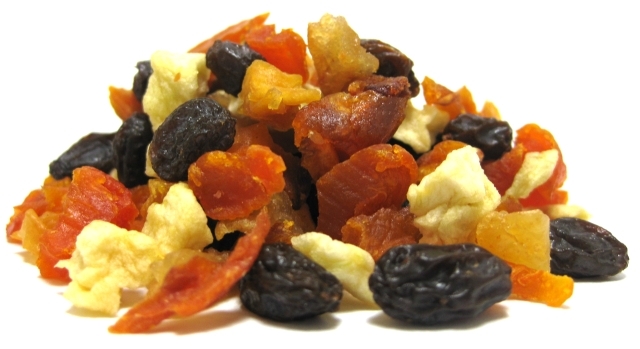 Uses: Raisins are a delicious snack and easy to carry. Add them to main dish recipes, salads, puddings, baked goods or anything you would like to add a natural burst of sweetness too. 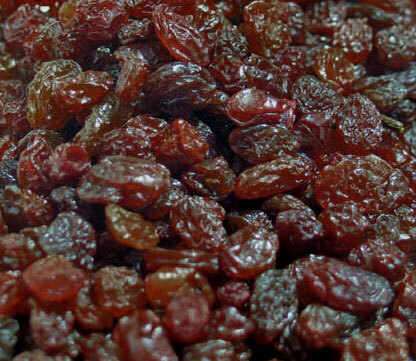 Ingredients: Raisins, Sulfur Dioxide (added as a preservative). Comments: Raisins are sun dried grapes. Grapes have long been important to human societies. Throughout ancient literature grapes are mentioned; as a fruit, as wine and as a dried fruit. Drying fruit is a very old method for preservation. 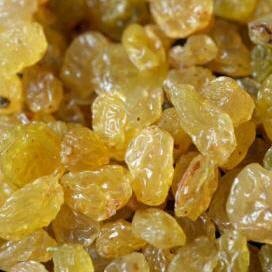 Our golden Raisins are sweet and subtle in flavor. Comments: These green grapes naturally develop a dark brown color as they dry in the sun, a process that takes from two to three weeks. Nutrition Facts: Serving Size: 1/4 cup (40g), Amount Per Serving: Calories 130, Cal. From Fat 0, Total Fat 0g (0% DV), Saturated Fat 0g (0% DV), Cholesterol 0mg (0% DV), Sodium 10mg (0% DV), Total Carbohydate 31g (10% DV), Dietry Fiber 2g, Sugars 29g, Protein 1g, Vitamin A (0% DV), Vitamin C (0% DV), Calcium (2% DV), Iron (6% DV). Percent Daily Values (DV) are based on a 2,000 calorie diet. Ingredients: Strawberries, Sugar, Sunflower Oil. Comments: Strawberries (Fragaria Virginiana) are not botanically classified as a berry. However, this fact in no way deters millions of people from enjoying this delicious summer fruit. Strawberries are the most popular (non)berry in the United States. The origin of the name strawberry is unclear; but it is well known that strawberries have been a symbol of perfection and purity since the Middle Ages. Ingredients: Diced Pineapple, Roasted Peanuts, Banana Chips, Dark Jumbo Raisins, Chopped Dates, Diced Papaya, Brazil Nuts, Sunflower Seeds, Roasted Salted Soy Beans, Unsweetened Coconut Chips, Diced Apricots and Walnut Halves. Comments: Our finest nuts and dried fruits are blended to create this sweet and salty combination. May contain an occasional pit.